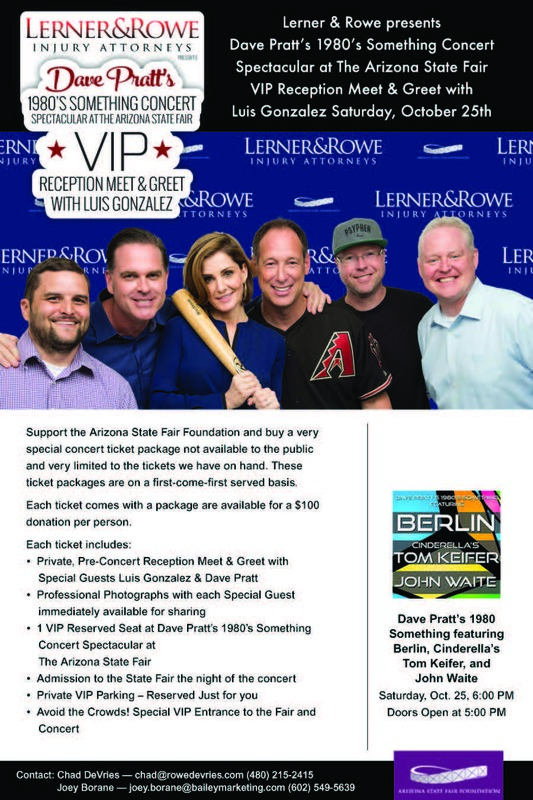 Lerner and Rowe Gives Back – a non-profit charitable foundation for the law firms of Lerner and Rowe – help support the Arizona State Fair Foundation by sponsoring an 80’s night concert and VIP reception with meet & greet on October 25th at the Arizona State Fair. The Arizona State Fair was first organized in 1884 and is still entertaining families today because of generous support by businesses, organizations, and individuals. Lerner and Rowe Gives Back presents Dave Pratt’s 1980’s Something Concert Spectacular featuring Berlin, Cinderella’s Tom Keifer, and John Waite at the Arizona State Fair on Saturday, October 25th at 6:00 PM. The 80’s night concert sponsorship helps support the Arizona State Fair Foundation and provides an opportunity for music and baseball buffs to purchase VIP concert ticket packages that include a meet & greet with former Arizona Diamondback ballplayer Luis Gonzalez and on-air personality David Pratt, otherwise known as the ‘Morning Mayor’. VIP ticket packages are just $100 and may be purchased on a first-come-first-serve basis by contacting Chad DeVries at chad(at)rowedevries(dot)com, or (480) 215-2415. Each VIP ticket includes: a private, pre-concert meet & greet and photo with celebrity guests Luis Gonzalez and David Pratt, VIP reserved seat at Dave Pratt’s 1980’s Something Concert Spectacular, and private VIP parking and entry to Fair and concert. Reserved seating concert tickets are $15 per person. General admission tickets are free with the purchase of a Fair ticket, plus parking. The fairgrounds are located at 19th Avenue and McDowell Road in Phoenix. The Arizona State Fair Foundation was established to ensure that the Arizona Exposition and State Fairgrounds, a self-supporting state agency, can maintain and consistently upgrade the 96-acre facility that hosts the annual Arizona State Fair and a long list of shows, exhibitions and events. Charitable gifts made to the foundation through donations and sponsorship opportunities help ensure that this Arizona time-honored community treasure is preserved for future generations to enjoy. The 130th annual Arizona State Fair is open to the public through November 2 (closed on Mondays and Tuesdays) and hosts a variety of fun-filled family entertainment, attractions, and rides for all ages. General admission tickets to the Fair are $10 (14+ years and older), $5 (kids 5-13 and for seniors 55+ years old), and free for kids under 5 years old. The Arizona State Fair Foundation is a component fund of the Arizona Community Foundation (EIN: 86-0348306). Find the latest information online at http://www.azstatefair.com, or by calling 602-252-6771. 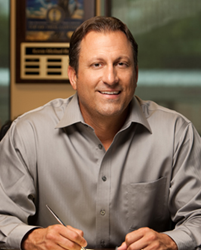 Lerner and Rowe Gives Back is a nonprofit organization founded by Kevin Rowe, managing partner of Lerner and Rowe Injury Attorney, P.C., and Lerner and Rowe Law Group. The organization believes in paying forward the law firm's achievements and successes by assisting other community organizations that serve children and families struggling from economic occurrences. Organizations they work with advocate for the improvement of children facing poverty, illness, disease and other areas of need. In addition to children in need, they support groups that touch the lives of the hungry, homeless, sick and abused, and even our four-legged friends. For more details about their nonprofit organization visit LernerandRoweGivesBack.com. For more details about the law firms, visit lernerandrowe.com or lernerandrowelawgroup.com. For current updates, follow them on Twitter (twitter.com/lernerandrowe) or Facebook (facebook.com/lernerandrowe).